Shark cage diving is an experience of a lifetime. Whether you’re curious to see these beautiful killing machines up close or you’re looking for your next adrenalin adventure, a shark cage diving trip makes an excellent gift experience. Our shark cage diving packages will get you to the best shark diving spots in Australia where the waters are perfect for many different species of sharks. You’ll see Tiger sharks, White tips, Threshers, Port Jacksons, majestic Great White Sharks and more! 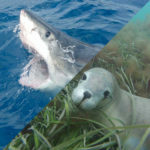 In particular, we’d recommend shark diving trips in South Australia, as this is one of the best places in the world for shark diving and seeing the Great White Shark in its natural envrionment. 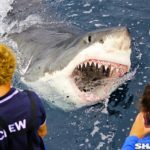 Of course, every effort is made to ensure that all our shark cage diving and great white experiences are completely safe, but that doesn't mean your heart won’t still be pounding! Looking a Great White Shark in the eye is definitely not for the faint of heart. Once you’re beneath the waves and watching these beautiful creatures swimming freely in their natural habitat, you’ll know why they’re so widely respected and feared. If you’re an adrenaline junkie looking for the ultimate water activity, then a shark cage dive or great white shark dive is perfect for you – or will make the perfect gift experience for a loved one. If something a little less frightening is more your style, then a whale shark swimming tour will leave you radiating joy and happiness. Yes, it’s still ‘swimming with sharks’, but these gentle beasts feed on plankton and are a delight to watch and engage with. 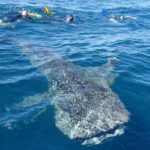 A swim with whale sharks is something that’ll truly resonate with anyone who loves nature, loves the ocean, and wants an experience with a magical creature.